• Intel conducted a three-month study that showed digital signs captured 400% more views than static signs. 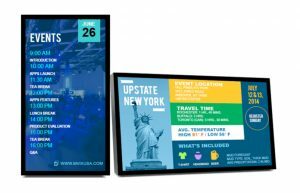 • A DataTrend report found that digital signage increased purchase amount and dwell time by almost 30%. • Because you can put up and take down different ads at the click of a button, you can be extremely effective in testing which of your marketing messages work best. As a benefit to our clients, we will be offering our clients with the opportunity to advertise their products and services on our new Digital Advertising Network. The roll out of the network starts in Winston-Salem and will then expand the digital network to all our locations in the eight county region we currently service. A site visit is needed to identify type and mounting of installed tv. We will do an assessment of whether or not the installed tv can be outfitted with the necessary equipment we need to run the ads and event info. (not locked down by IT). Identify intended location of digital display. Ensure path clear for guests to view. Ensure 110v power outlet is available. Ensure Wi-Fi is available and accessible (not locked down by IT). Provide any schematics / drawings of structural and electrical/plumbing/Internet cables, etc in the selected location to ensure we are clear to mount the digital display. Determine if a flat, not adjustable wall mount is desired by hotel/apartment complex or one that can be adjusted (articulating wall mount).